Save 25% on labour over walk-in customers. Customize your badminton racquet exactly the way you like it. Choose your configuration from the options below then drop your racquet off in our southwest Calgary store. 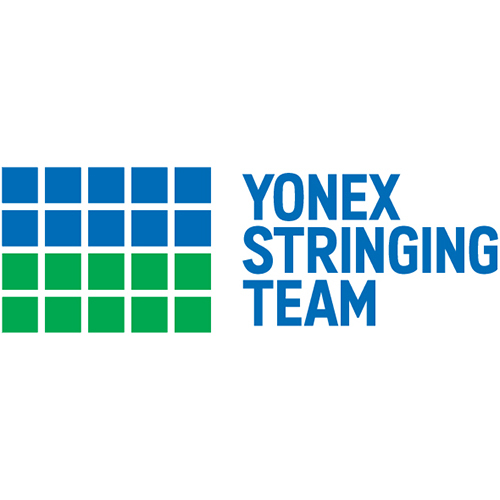 A master stringer from our Yonex stringing team will string your racquet. We will send you an email when your racquet is ready to pickup. 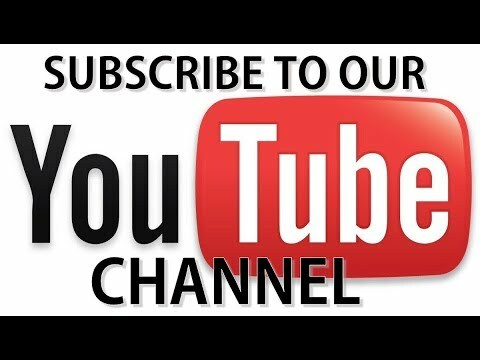 A video of your custom stringing will also be posted to our YouTube channel so you can be sure that it was strung to the highest standards. Customers who pre-order online automatically get a 25% discount on base labour. Pull speed determines how stiff the string bed will be. For maximum power, choose SLOW. For maximum control, choose FAST. We offer three turnaround options for custom stringing. Regardless of the turnaround you pick, your racquet will be done as soon as we can do it. But if you want to jump ahead of other racquets in line you can choose from one-hour guaranteed or one-day guaranteed. In any case, we will email you when your racquet is done. 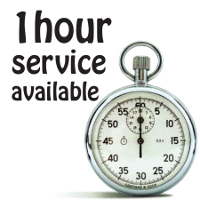 Please Note: If you choose one-hour turnaround, we will email you to set up an appointment for one-hour custom stringing service. One hour service is available by appointment only. 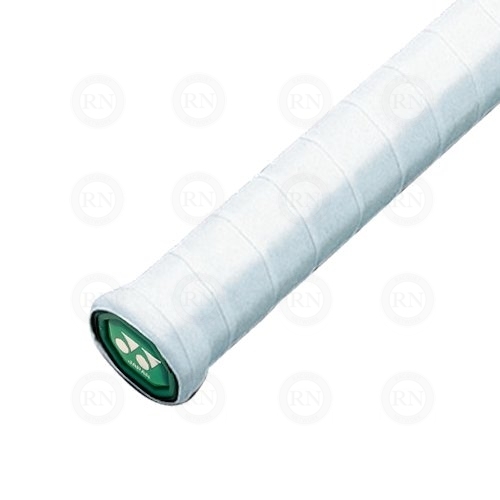 A fresh overgrip prevents the racquet from turning in your hand during smashes and drives. This helps to increase your accuracy and gives you a competitive advantage over players who do not use overgrip. 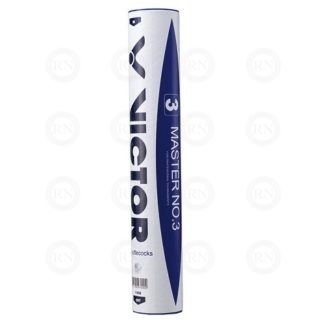 Save over $13.00 on a single tube of Victor Master No 3 shuttlecocks when ordering online. Offer not available in-store. Limit of 1 tube per transaction. Customers who pre-order online will always save money over walk-in customers. 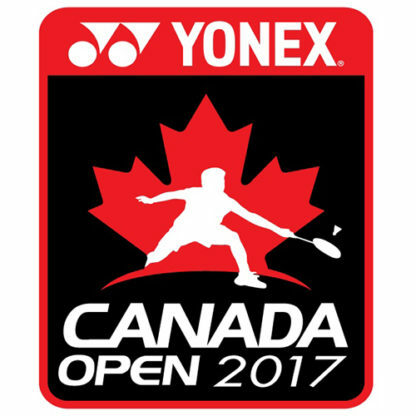 Fast and convenient badminton racquet stringing service in Calgary. Two-week warranty. Our racquet stringing technicians are USRSA trained. 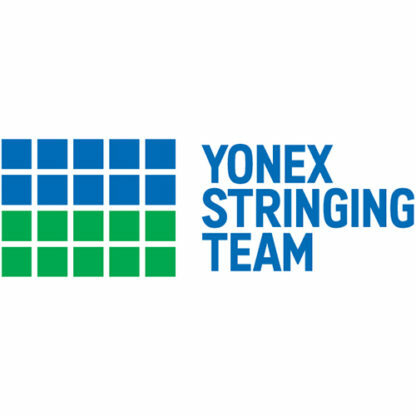 Most are also members of the Yonex Stringing Team. 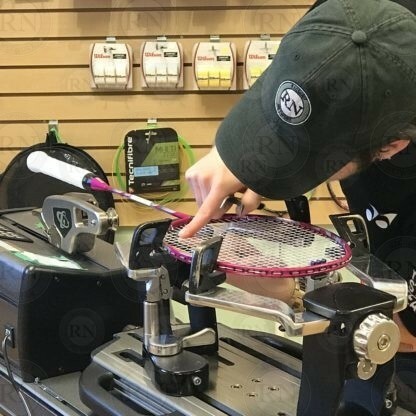 All racquets are checked and verified by a second stringer to ensure quality control. 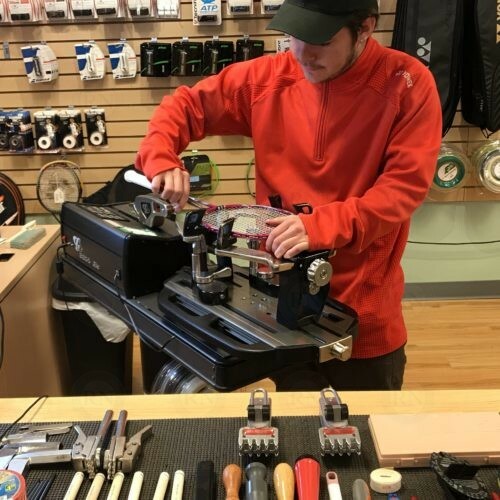 Our stringing machine is the best in the business. 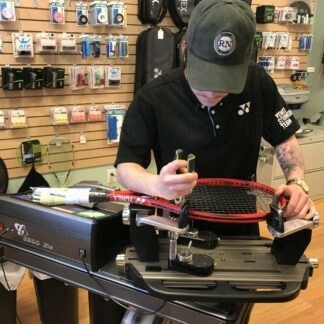 Custom racquet stringing services are covered by a two week warranty and come with a satisfaction guarantee. 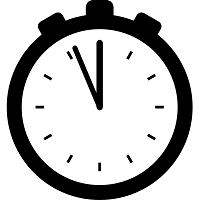 Customers can choose from one-hour, one-day and one-week turnaround. 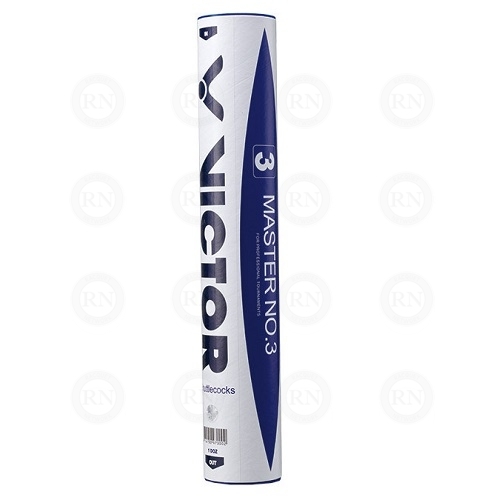 Customers may also choose to have their racquets shipped to them after they are repaired. This is a popular option for our out-of-town customers. See our RACQUET SERVICE POLICY for details. This is a very good place that always do good job on my racket. I like hi tensions so this is wy I always comes hear. I am impressed with how fast and accurate you guys are. Thank you. Racket Network saves the day again. Thanks guys. It’s good to know I can count on you. Based on the advice of a friend who is a regular customer, I ordered one day stringing on the website for my son’s badminton racquet. I like them on Face Book right away so I saved ten bucks immediately. Then I brought the racquet into the store and dropped it off. My wife saw the bakery next door so we went in to get some pastreys. As we were getting into our car to drive away we got an email saying the racquet was ready. So we didn’t even get out of the parking lot and we already had the racquet back. And it was very cheap to so I will be back for sure and I will tell the other parents on my son’s badminton team. It was ok but not great. I brought my raquette in and paid for one week and got it back in 6 days but they didnt call me to say it was done. I had to call them even though they promised to call me. RESPONSE FROM MANAGEMENT – As we explained when you brought your racquet in, we don’t call people on the phone. We notify them by email when their racquet is complete. That way we have proof that cusomters were notified. We also have proof of the time and date of the notification. In this case, we sent notification to you three hours after receiving the racquet. It was sent to Mxxxxxxxxxm@xxxxxxail.com. Very excellent service. I brought my racquet in for stinging in a week and got it back same day. Just like the time before. So Im happy. You guys keep getting better and better. I remember bringing my racquet to Brent’s house to get it strung. Now you are in your new store and it’s gorgeous. Thank you for a decade of great service. I will always be a customer. Thanks again, guys. And thanks for the coupon. I am a Racquet Network lifer. Specatcular service you guys. I will be back and I will be telling all of my friends. We used the new website pre-order system for the first time last week. 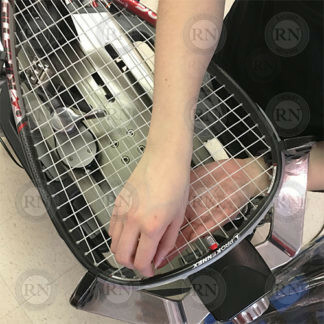 We placed an order for restringing my son’s racket late Wednesday evening. My wife dropped it off on Thursday morning. Just after noon, my son got an email saying his racket was ready. This was even faster than we expected. Thanks for the review, John. Our online system has sent you a discount coupon you can use within 30 days. We know that Jeremy likes to restring at least once a month, so that will save you some money on your next order. See you soon. You guys seem to be getting faster. I dropped both of my Voltrics off on Monday morning and paid for one-week serive. Got a call after dinner saying they were ready. Awesome as always guys. Thanks. And thanks for the discounts for reveiws to. It really helps to save this money on top of the great and really fast service. First time user. Totally impressed. Had my dad drop my racquet off when he was in Calgary on Sunday. Came home from school on Tuesday and the racquet was sitting on my kitchen table in Lethbridge. Was exepecting to get it back in a week or two. Got it back in two days. Nice. Brent. Thank you so much. You are a saviour. My daughter was getting her racquets strung at our club where the guy was stringing way over maximum tension. She broke three racquets in three months at about $300 per racquet and warranty was refused on all of them. Once we started buying from you and learned how to make sure we were covered, she stopped breaking racquets. She has been playing for almost six months now and not one broken frame. You have save us so much money. We are customers forever now. Thanks again for everything. Brent says HI Shelley. Thank you for the feedback. Brent understands how expensive it can be to have kids in a competitive program. The policies we have in place ensure that our clients are protected by warranty coverage. The manufacturers know how careful we are about warranty frand, so legitimate claims are never refused. First time customer and, I must say, a very impressed first time customer. I brought my badminton racket in to get new strings put in yesterday. I paid for one week but got it back in less than two hours. Rest assured, therefore, that I will be back in the future. Thank you, Amarinder. It doesn’t always work out that way for one-week turnaround customers, but we get every racquet done as soon as we can. Have a great week!! I visited your store recently and was simply amazed at the quality of the service. I was recently laid off and money is bit tight right now. I also recently broke my badminton racquet recently so I dug an old Carlton racquet out of the closet and brought it in to see if it could be salvaged until I get back on my feet. The lady helping me did not bat an eye and did not judge me. She told me that the racquet needed some repairs but was perfectly fine otherwise. When I picked the racquet up three days later, I barely recognized it. New string, new grommets, new grip. It looks brand new and all I had to spend was $50.00. All in all the experience was overwhelming positive. So much so that I will definitely be giving you my business the next time I am in a position to buy a new racquet. I am extremely happy with your satisfaction gaurantee. 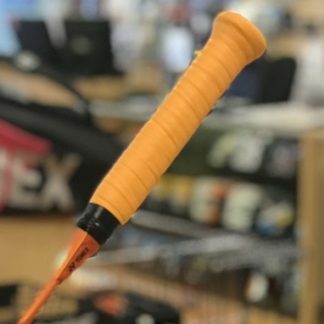 Before you had it I was afraid to try Yonnex BG 66 badmington string. But then with the satisfaction gaurantee I was not afraid anymore. It is very good string even though it breaks more than the other BG 65. So now I am switched to that string. Very good. Thank you. I always bring my racquets to Racquet Network. I always ask for one week service. I always get it back in a day or two. Sometimes even the same day. I am very happy with the service you provide. I tell all of my friends to come to your store. Thank you for excellent service over the past five years. I apologize for not posting a review sooner. Excellent service. I brought my racquet in at 3:00 on thursday. They called at 5:30 to say it was done. I was suprised because I paid for 1 week but got it back in about 3 hours. I will be back. I am very happy with your one day service. Thank you. I am very upset. I get my raquet strung Monday. I play Monday and string brake. I take it back but you wont string it again for me for free. You are crooks. I won’t be back ever. Jiang. You chose the thinnest string that Yonex makes — BG66. We advised you to choose something thicker because you told us you were playing with nylon shuttles. 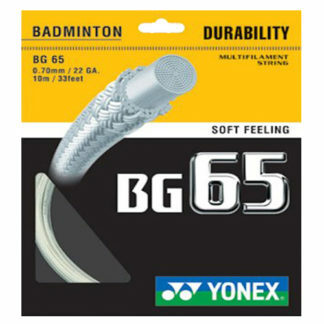 We warned you that BG66 was subject to breakage and that we could not recommend it to anyone playing with nylon shuttles. Nevertheless, you insisted on going with BG66 because your friend recommended it to you. The next day you came in and demanded a restring, insisting that we must have strung the racquet incorrectly. Our stringer did not make a mistake. She strung it according to factory specifications, as she always does. As a result, you were offered our standard warranty, which is a warranty on the labour but not on the string. You refused this offer and stormed out of the store. At that point we could no longer help you. Unfortunately, strings break. Sometimes they break the first time you use them. That is why manufacturers do not offer warranties on strings. The only thing we can do is offer our best advice — which is what we did in this case. We are sorry that you are not happy. You guys are great. I am so happy to find you. You are close to my house and your staff are so expert. Thank you for the help. Very fast. Thank you. I will be back. I broke my stings the last match I played, but I put my raquet back in my bag and forgot about it. I didn’t remember until about three hours before I was supposed to play again. Thanks god for Raquet Network. I took it in after work to get it repaired and I got it back before I played again at 7:30. I was very happy to have this opportunity. So you have earned my busness. I have had my racquet fixed three times by Racquet Network. In all cases I received exactly what I ordered. On one occasion I ordered the wrong tension. The staff called to warn me that stringing at that tension would void the warranty and might break the racquet. I will continue to use this company and would happily recommend them to others. Management response – Thank you for the review (we think?). The system will send your coupon automatically — as long as the review is with 30 days of purchase. I got the 1 hour service. I dropped my racquet off at 2:05 and got an email saying it was ready at 2:43. It was perfect. You also had the color I wanted which was orange. Thank you. See you next time. I was promised one-hour service but you didn’t deliver. That’s not cool. True you refunded the difference between one-hour and one-day, but I think it should have been free. Management response – You are correct. It took us 1 hour and 32 minutes to do your racquet. We had some issues with grommets. We called you 30 minutes into the job and told you it would be a little late. We also emailed you the same message. And we gave you a discount so you paid the one-day rate instead of the one-hour rate. So you paid for 24 hour turnaround but got your racquet in 92 minutes. We are sorry if you are still not satisfied. I usually get my racquet strung really tight so the strings don’t move around. This time the guy talked me into getting it strung loose so I would have more power. But now the strings are moving around. I took it back but they refused to fix it. I realize I got what I want, but I was talked into something I didn’t want. Management response – Stringing at low tension provides lots of additional power and adds to string durability. However, the strings will move around some. This is not a bad thing. It does not affect how the string bed performs. You requested a tension of 17 lbs. We have your signature on the stringing form indicating this to be the case. When you came in to complain about the strings moving around, we offered to restring it for free if you paid for the string. You refused. The offer still stands if that is what you decide to do. We love you guys!!! We drive in from Lethbridge to get our racquets maintained. We always get one-hour service. 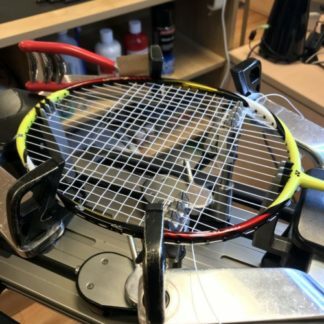 As per the advice of your staff, we now do preventative stringing and do not wait for our strings to break. Since we started doing that, we haven’t had a single issue. We’ve told so many of our friends about you. Now they are all going to you guys, too. Congrats on having a very successful family business. The place I usually go costs less, but it can take a week or more to get my racquet back. I went to you guys because you have guaranteed one day service. For me it was worth it. For 5 dollars more I brought my racquet in on Tuesday and got it back Wendsday morning. It was exactly the right tension and exactly the right colour that I wanted. From now on I will be coming to you guys for my racquets and strings. The service was fast and the price was fair but you don’t stock Victor string. So I can only give you four stars. Management response – Thank you for the feedback, Sam. We are considering adding Victor to our lineup. We will let you know when we do. I have been bringing my son’s racquets to Racquet Network ever since I discovered you three years ago. My son plays competitively and is very particular about how his racquet is strung. He has been this way ever since he lost a critical point over a broken string when he was playing in his first final. He loves the way you guys string. He loves the fact that every racquet is strung exactly the same way. He swears that other places we have tried are not the same and are not consistent. 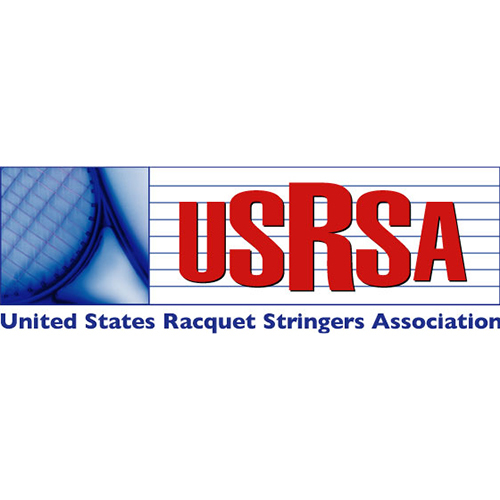 Even though we have had at least five different people string racquets at Racquet Network, all of the racquets were exactly the same. Keep up the good work. You have earned a customer for life. I brought my Z-Speed in on Tuesday for restringling. I paid one week service, but got it back the same day. On Thursday, I play and everything were fine. I played again on Saturday and a string got broken so I took it back for warranty because you have a 2 week warranty. He fixed it and I got it back the same day. I had to pay for string but the work was free warrant and I got it back in about fore hours. Thats is really good service. I played two times since with got no problems. I looked all over for the string my son wanted in the color he wanted. You guys were the only ones who had it. Thank you very much for having it and for stringing the racquet so quickly. My son is very happy. We will always come to your store from now on. I am giving your a five star rating, which is something I rarely do, but in this case you definately deserve it. I placed my order for three different racquets through your website on Monday morning from work. I then had a courier bring the racquets over. One of the racquets was mine. Two were my co-workers racquets. My instructions for each racquet were very specific. We had different string and different options on all of them. On Wednesday morning, Canada Post delivered them to our office. All three racquets were pefect exactly as we ordered them. So even though I almost never give five stars for reviews, I am giving you five stars today. Everything was perfect and you delievered them back to us in less than 48 hours. Very fast at a fair price.